Liberty Township, OH (May 1, 2018) – Last week, Mother Teresa Catholic Elementary School (MTCES) 5th graders participated in the school’s annual invention fair where students present their Rube Goldberg projects. Rube Goldberg was an American cartoonist whose invention drawings depicted complex gadgets performing simple tasks in complicated ways. The creation of such machines is part of the STEAM (Science, Technology, Engineering, Arts, Mathematics) curriculum at MTCES. 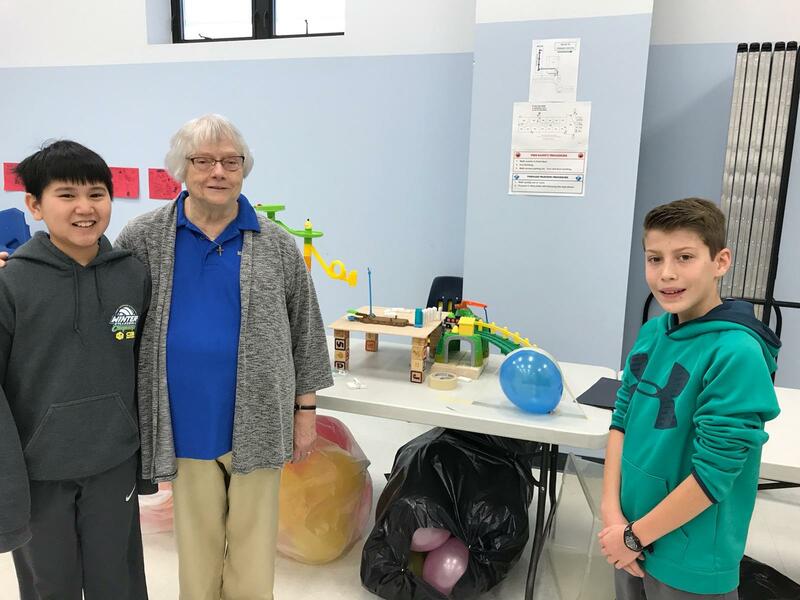 “I find that the Rube Goldberg project helps students find enjoyment in what can be an intimidating concept of physical science,” said Lisa Hollstegge, the 5th and 6th grade science teacher at MTCES. “Students design and build what looks like a complicated contraption to perform a simple task, such as ringing a bell, teeing up a golf ball, pouring water in a cup, or popping a balloon.” The invention fair gave the 5th graders an opportunity to demonstrate their inventions to their teachers, parents, and the rest of the student body. The Rube Goldberg projects are just one aspect of the award winning STEAM program at MTCES. The school has received the Governor’s Thomas Edison Award for Excellence in STEM Education for ten years. The award recognizes schools and teachers who stimulate student scientific research and technological design and extend STEM education opportunities beyond traditional classroom activities. Beginning in kindergarten, MTCES students follow inquiry methods to help them understand the “why” of science. They study how butterflies develop, what temperature is key for hatching chick eggs, and how to conserve water. All 7th graders showcase their strengths in research and following the scientific method through their science fair project. This year, 30 MTCES students advanced to the district fair and eight of those will present at the state fair on May 12th. As a Google school, students utilize all Google docs resources. They easily save information on the cloud and share documents with their classmates and teachers. Students in grades 2-4 create presentations and short stories, while 5th graders utilize spreadsheets and write formulas. Upper grade students learn computer programming through Code.org. Students have over 80 Chromebooks and 62 iPads at their disposal. MTCES science teachers introduce students to many different careers in the engineering field. By developing partnerships with area businesses, students participate in field trips that enable them to observe professions in the aerospace and manufacturing industries. Sixth graders participate in an engineering design program to build bridges that can hold and support a 500 gram weight. After researching bridge types and materials, they create functioning bridges. MTCES students utilize real world math situations to enhance classroom study. Coursework includes calculating discounts and markups when shopping, measurement and design of rooms, graphing survey data, and writing equations from movements like walking and paper clip chains. Sixth through 8th graders have the opportunity to participate in the Math Counts program, where students learn to work together as a team to solve problems. The group participates in the annual Math Counts competition at the University of Cincinnati. MTCES has a robust art curriculum for all students in grades K-8. Purchasing both a 3D printer and a kiln has diversified the art classroom. This week’s Spring Arts Festival includes concerts from the school bands and performance choirs, and student artwork will be on display. MTCES is one of only three independent, private Catholic elementary schools in the Archdiocese of Cincinnati. The School, which opened in 1998 to 20 kindergartners in the basement of a church, now serves 518 students in grades K-8 on its 25-acre campus in Liberty Township. The opening of the new academic wing in 2016 allows us to bring our mission to more who seek it. MTCES is planning a variety of activities to celebrate its 20th anniversary during the 2018-19 school year.